Another splendid offering from Altrock in Italy (who released Yugen's excellent debut album), Rational Diet is the first internationally released CD from a RIO band from Belarus who have been around for several years; three of the tracks included here were recorded in 1999, the remainder date from 2004, and all were included on the band's earlier releases. The album is bookended by 3 pieces from The Grey Notebook, all composed by guitarist Maxim Velvetov, while the filling in the sandwich comes from The Shameless and the pieces were composed by reeds player Vitaly Appow and violinist Cyrill Christya. There's quite a marked contrast between the pieces from the two different sessions. On the Grey Notebook pieces the core trio of composers work as a sextet with keyboards, bass and drums and the music is largely instrumental, recalling Univers Zero and Henry Cow. The pieces from The Shameless see the band working as an entirely acoustic quartet (cellist Alla Pustchina augmenting the core trio) plus guest vocalists, and here the music is closer to the chamber rock of Art Zoyd's first three albums. 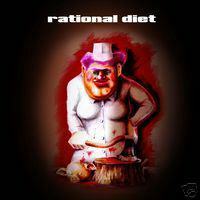 Although there are clear influences from several key RIO bands, Rational Diet have a definite identity of their own. A lot of the music draws as much on their Slavonic heritage as it does on contemporary avant rock, with elements of Shostakovitch and Bartok clearly audible. The Slavonic feel is reinforced on the acoustic tracks by guest vocalists reciting the work of avant garde poets over the music, a bold move which works remarkably although it could have gone badly wrong in less capable hands. The closing track, a 14 minute piece from The Grey Notebook, is something of a RIO masterpiece with a powerful, near-zeuhl vocal from guest Cyrill Yelshow. Maxim Velvetov's guitar work is particularly impressive on the electric tracks, while Vitally Appow's contributions on bassoon, sax and accordion add a distinctive edge to the imaginative arrangements throughout. Despite being compiled from 2 different and quite distinct releases, Rational Diet works very well as an album in its own right. There's a high standard of composition and performance throughout, and the contrast between the acoustic tracks and those with a full band is highly effective. The three main composer/performers all bring something of their own to the RIO sound, and hopefully there is more to come from this intriguing Belarussian outfit. Recommended to anybody with a taste for chamber rock, in particular fans of Art Zoyd, Univers Zero and Henry Cow.